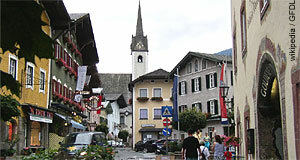 Golling is a small town with approximately 4,000 residents in the Salzburg province. More specifically, Golling can be found in the Tennengebirge area of the the Tennengau region, about 25 kilometres south of Salzburg city. It is well-connected to the capital via train links and the motorway. Golling is the last bigger settlement before the Hagengebirge and Tennengebirge, two major mountain ranges of the Northern Calciferious Alps. This makes Golling mainly two things: A particularly rainy place even by Salzburg standards; and a good starting point for hiking excursions into properly Alpine areas without having to go far from Salzburg. The first settlers of Golling were probably Slavonic tribes. In the 13th century, Golling became a market town and gained importance not only for its economy, but also for strategic reasons: The local castle, Burg Golling, held an important position on the transportation route through the Alps. It was home to a regional court since 1438 and served as a prison. Today, Burg Golling is the main attraction of the town. It houses the town museum and a small collection of natural history items. Once a year, it provides the right location for a Medieval Fair. In addition to the castle, note also the Thannhauser Bauernmuseum, a museum of folk culture. However, Golling is mostly attractive for people who look for good hiking opportunities close to the city of Salzburg. The Gollinger Wasserfälle (Golling Waterfalls) are said to be among the most beautiful in all of Austria. Following the course of the Salzach river can also be quite charming. Several valleys of the Hagen- and Tennengebirge are extremely picturesque and offer paths for hikers at all levels of expertise. In order to get around, you might need your own car or you just rent a car in Salzburg. Golling itself is well-connected by public means of transport.